“Come with me to Amphawa”, Janjira proposed. “I’ll be there visiting family for the weekend and can show you the floating market. Janjira had replied to a public trip message I had posted on the Couchsurfing website and, after the preliminary texting ritual, she’d come up with this. Amphawa, I googled. Hell, this looks like a world-class sight….and I’m getting a local to show it to me! What else could I wish for? Come the time, I was lucky I had this plan nicely arranged for me, as otherwise I would have probably stayed in Chiang Mai for the entire length of my vacation, falling into the charms of slow travel. So we agreed to meet at a shopping mall next to the Victory Monument BTS station, which is also known for its popular minivan open-air station serving popular destinations such as Ayutthaya, Pattaya or Kanchanaburi. There, watching the clerks managing the minivan traffic, booking seats and eventually assigning passengers to their vehicle -all this to the soundtrack of roaring traffic on the main road- I had my first inkling of something I was to discover and rediscover many times since: when traveling from Bangkok, getting out of the city is the first challenge – and not a negligible one. 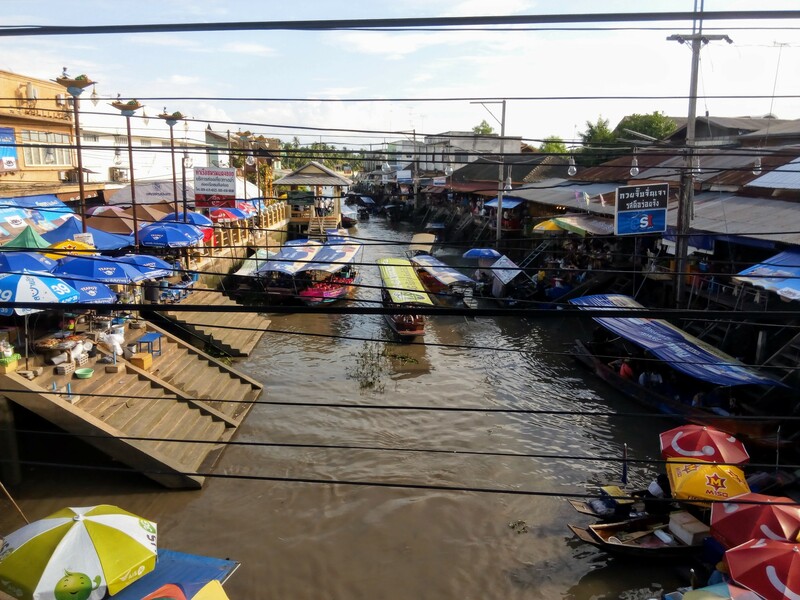 After about three hours in a freezing mini van and some polite conversation, we got to Amphawa and walked under a scorching sun to check in at my modest guesthouse. “No, no…of course not!” I answered, with a puzzled smile. I wondered, what kind of male pigs is this girl used to? Are they Thai or farang? In the evening we hit the market and ate delicious pad thai cooked in one of the many boats that acted as kitchens. Then we walked some, checking out the souvenir shops and looking for sweets for Janjira’s nieces. Eventually we met up with some childhood friend of hers who showed up with her mom. They cracked jokes in Thai and I smiled to hide my boredom. We all had desert. Referendum? I thought. Of course – this was the reason why Janjira was coming home in the first place. But it’s almost 12 hours before the voting begins. I mean – how does having a drink now affect on…? Oh well. I guess the alcohol ban will do good to my body. I picked up some snacks at some cooked food stalls on the way home and got ready for a good night’s sleep in my air-con room.